The Delaware County Historical Society has just completed a major enhancement to The Barn at Stratford. 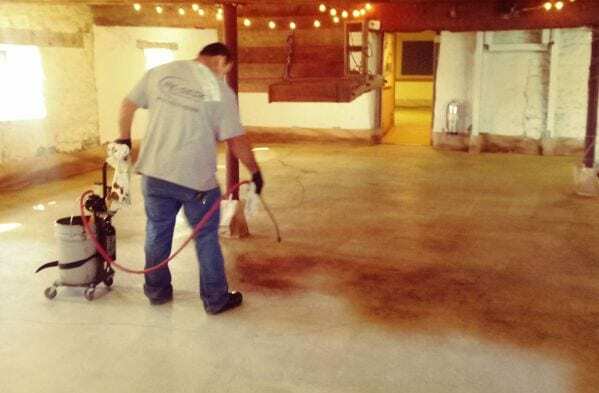 The decades old concrete floors of the Barn’s Event Gallery, Stage, and West Gallery have been ground, leveled, and completely refinished with a dazzling new “Carmel” finish. 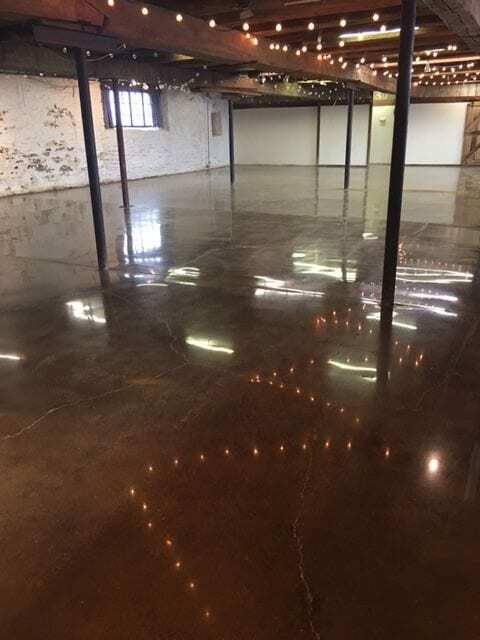 The freshly refinished floors have already been utilized by 150 Delaware School Students as they participated in the “Meeker Experience: The Underground Railroad in Delaware County” and a ReMax Client Business Meeting. The 1847 barn originally had dirt floors beneath the stables. 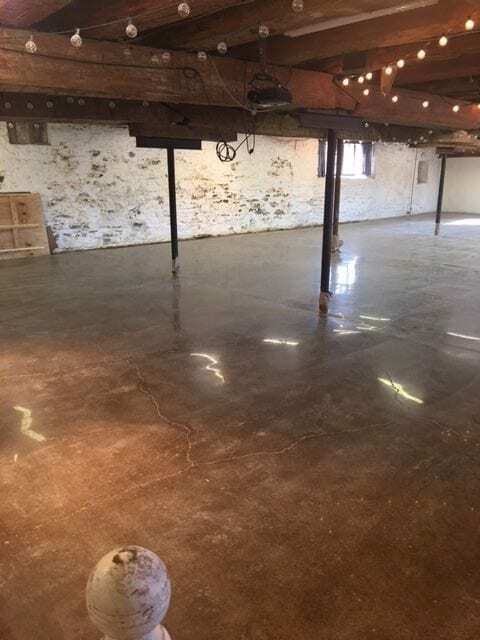 As the barn was converted from animal housing to antiques and auctions, concrete flooring and an elevated stage were added by Garth’s Auctions. 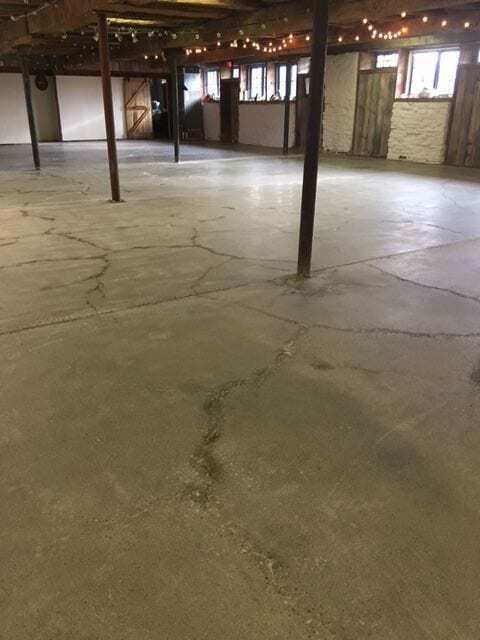 The unfinished grey concrete floors stood up to decades of use and wear. Hand trucks and dollies moved precious (and often heavy) antiques into displays and out to waiting customers and shippers. By 2017, those floors had numerous cracks and crevices as well as several instances of elevation which limited the dance floor size. 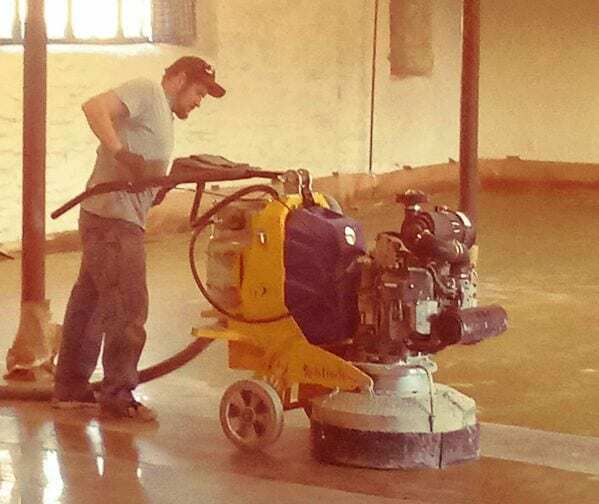 The job of refinishing the floors was awarded to Redeck of Central Ohio. They brought in powerful grinders managed by skilled workmen who guided the machines across every inch of the floor’s surfaces. Not just once, but several times making sure that the surface was clean and level, ready for it’s new finish. The work of creating a durable new floor in a “Carmel” finish took several steps. First, base coats of stain were sprayed onto the freshly cleaned surfaces. Then multiple layers of complimentary stain colors were hand drizzled. The dry surface was then lightly polished. Finally the finish coat was buffed and the floors were ready for inspection. While the new finish looks bright and shiny it is not slippery, so get out your dancing shoes. 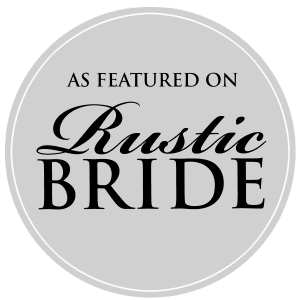 If you are planning an event, make an appointment with our Venue Manager to see our refinished floors while you tour the historic The Barn at Stratford , Contact Us.